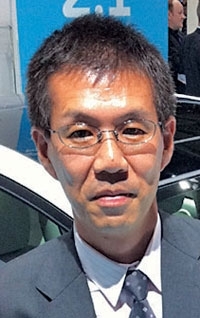 Satoshi Ogiso: Too many Prius models would weaken the model's distinct image. FRANKFURT -- Toyota is considering hybrid powertrains for all of its vehicles, but it must not expand the Prius brand name too far, the vehicle's chief engineer said. And Toyota must not overlap market segments with a hybrid version of an existing vehicle that would cannibalize a Prius product, he said. Satoshi Ogiso, chief engineer for the Prius family of vehicles, said Toyota is considering a Prius-badged minivan, but he worries that such a vehicle might be too close to the upcoming Prius V tall wagon. "There are so many studies to expand the Prius family. We have to consider the customer and the market segment," Ogiso told Automotive News Europe sister publication Automotive News during the Frankfurt auto show. "The Prius image is very strong. From a plan management perspective, we should not expand too quickly." Similarly, Toyota cannot put its Hybrid Synergy Drive into a regular Toyota product that might conflict with a Prius vehicle. Such a situation could include the creation of a hybrid Venza, which could cannibalize sales of the Prius V tall wagon. "We sold 300,000 Priuses in Japan last year from just one model. So it's good to conserve our brand image," he said. "Expanding to too many models has some risk. When you have Prius V, Prius C and a Prius Plug-in, that's a quick expansion." Ogiso said the upcoming Prius C -- which arrives in the United States next summer and is based on the subcompact Yaris platform -- will get better fuel economy than the standard Prius. Its acceleration may be slightly slower than the Prius', but its driving dynamics will be "more agile and maneuverable," he said. The Prius C's styling will be less aggressive than that of the concept shown in Detroit this year, Ogiso said. It will carry some of the design cues of the standard Prius to maintain a family resemblance.